The daylilies did their momma proud this year. Unfortunately, they've just about finished blooming. They bloomed for about a month and a half. 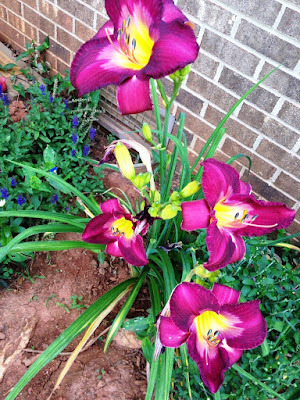 For those who have daylilies, how long do yours bloom? Hot and dry here too, Val. My roses haven't popped back after their first blooming like they normally due and I think it's due to the dryness and heat. Wow. 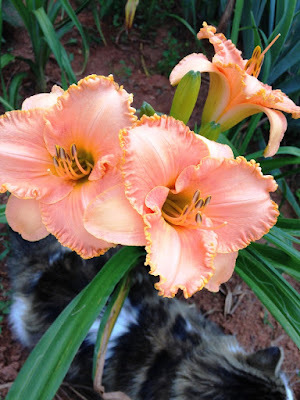 Love your daylilies - and your photobomber. I don't think ours have ever lasted that long. You are the daylily queen. Thanks, EC. I don't know about the queen part, but I certainly appreciate the thought. Grin. Pretty. Do they close at night, hence the name? In a manner of speaking. The bloom only lives for one day. Thank you, Yvonne:) Glad you like them. haha wanted to be seen too. Beautiful colors. I don't think we have any lilies. Thanks, Alex. What's in your garden? Beautiful pictures. Love the colors. Thanks, Jamie:) Glad you enjoyed. Gorgeous colors. I only have orange ones that grow wild. Where I lived before I had the orange, but they were double blossoms, one on top the other...so pretty. Mine have been beautiful this year as they are year after year. Wonderful flowers, great photos. My day lilies are almost all gone. I read somewhere years ago that day lilies live for a day, thus the name. Thanks for sharing these beauties. Mine are very plain compared to yours. I'm sure yours are gorgeous. They're lovely, Andra. Mine are about done blooming, too. Must be end of season for them, hey? They are beautiful, not sure how long mine last but they are hardy and drought tolerant. Kindness - is indeed a wonderful word for the day. The flowers are lovely. They go too quick here. Gorgeous photos!! 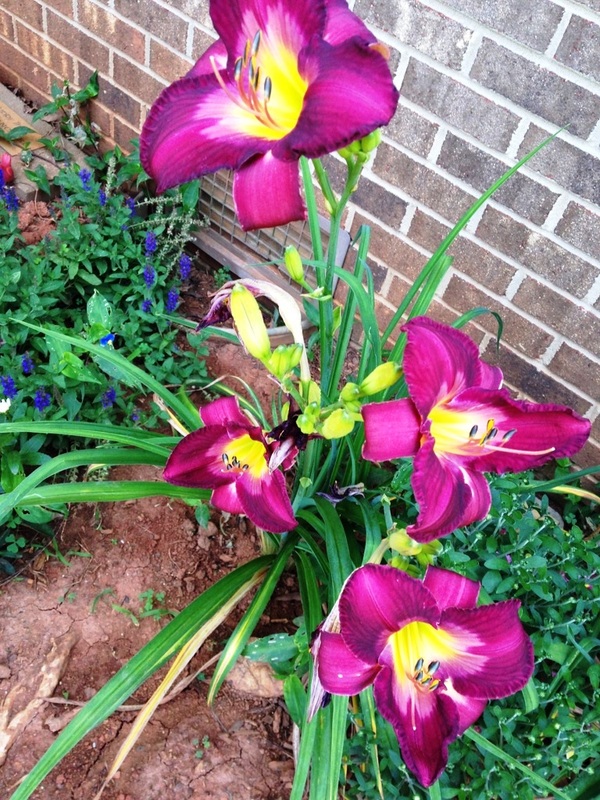 Our day lilies are just starting to bloom. Ours last till around September. Give Franky a hug from me! Big Hugs Sandra! That's a healthy amount of time. I agree, it is a good amount of time!